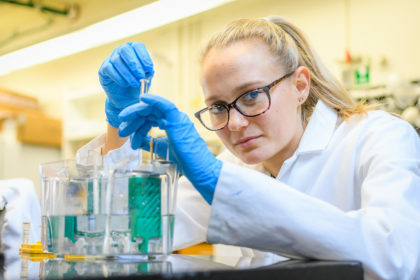 Student-athlete Rylee Simons ’19 has found success both on and off the field, laying the groundwork for her to continue in Clark University’s fifth-year Accelerated B.A./Master’s Program in Biochemistry and Molecular Biology next year. Medical school, she hopes, will soon follow. 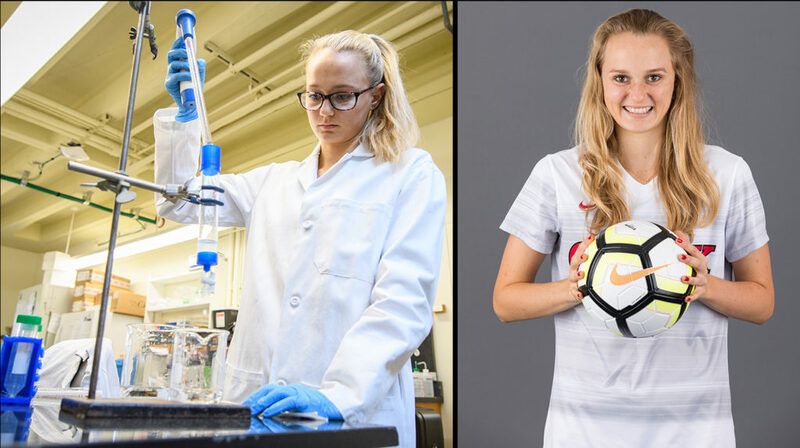 Simons has balanced captaining the women’s varsity soccer team, majoring in biochemistry and molecular biology (BCMB), and conducting research in the laboratory of Professor Donald Spratt, a protein chemist and structural biologist. She’s also found time to volunteer and participate in summer internships. The south Florida native traveled nearly 1,500 miles to attend Clark. She wanted a new experience that would fulfill her college bucket list. “Being a student-athlete has really enhanced my time management, teamwork, and leadership skills,” Rylee Simons says. She has been a starter on defense for four years and team captain for two. The last three years, she’s made the New England Women’s and Men’s Athletic Conference (NEWMAC)’s Academic All-Conference Team. Besides pushing her own body to its limits on the soccer field, Simons has been interested academically in how all human bodies function — the underlying biochemical processes and reactions that keep us healthy and alive. She decided to major in biochemistry and molecular biology to better understand this complex science. Recently, she saw her scientific research published in a peer-reviewed journal, Protein Expression and Purification. She was a co-author on an article titled “Rapid and efficient purification of Drosophila homeodomain transcription factors for biophysical characterization,” with her peers, Rachel Orlomoski ’17, M.S. ’18; Aaron Bogle ’18; and Jeanmarie Loss ’18, and their faculty mentors, Jacqueline Dresch, assistant professor of mathematics; Robert Drewell, professor and chair of biology; and Donald Spratt, assistant professor of chemistry. Below, we asked her to talk more about her experience over the past four years. Describe the research and project you are conducting with Professor Spratt. The goal of this project is to better understand a specific type of protein and how it binds to DNA. The proteins are called homeodomain transcription factors, and they control a lot of development processes in many different organisms. The project includes purifying the proteins and performing assays with DNA to determine the protein-DNA binding interactions. What other experiences have you had during your four years? Before Dr. Spratt’s lab, I was working in Dr. John Gibbons’ lab on an opportunistic fungus called Aspergillus fumigatus. In the summer of 2017, I went on a medical mission to Peru to provide basic medical and dental care to remote villages in the Amazon. That same summer, I had an internship at the Cleveland Clinic in Weston, Florida, where I shadowed physicians in multiple specialties, including cardiothoracic surgery, general surgery, and orthopedics. During the school year at Clark, I have volunteered at the Boys and Girls Club of Worcester, Goddard School of Science and Technology, UMass Medical Center, and Saint Francis Adult Day Health. At the Boys and Girls Club, my soccer team and I worked with kids to encourage good sportsmanship and team-building skills. I volunteered as a fifth-grade teaching assistant at Goddard, and in the UMass Endoscopy Department I made patients comfortable after procedures and filed patient discharge papers. At Saint Francis, I organized and encouraged participation in activities, like games or arts and crafts, that provide physical and mental stimulation. What do you like best about being a student at Clark? I love all the opportunities I’ve had. I’ve played soccer all four years at Clark, and it was amazing to be able to continue the sport I’ve been playing since I was little. I love the classes I take. I also was able to develop close relationships with my professors, which enhanced my learning in each subject. I’m also grateful that I have the opportunity to participate in research as an undergrad, and plan to continue this research in my fifth-year program. Who is your mentor at Clark? My coach, Brie Smith, has served as a mentor throughout my four years. She not only has developed my soccer ability on the field, but also has helped me develop as a person. Brie has always been there to listen, no matter what the subject, and has been a great resource since the beginning of my Clark journey. What do you hope to do after you graduate from Clark? I plan to attend medical school and one day become a great doctor. Clark has helped me develop the skills and qualities that will push me to success. I definitely feel well-prepared for my next step in life because of the opportunities provided here.